These clinics are an opportunity for couples to enjoy golf instruction together! Each will follow a fun format to allow skill development and social interaction. The sessions will last for 1 hour. Please contact the Jackson Park Instruction Department with any questions at (206) 363-4747 or email their PGA Director of Instruction, Jon Larson, at jlarson@premiergc.com. Or, contact our Fitness Director, Jacob Galloway, at jgalloway@sacdt.com. Summer sun; summer fun. Whether you are going on vacation or enjoying the multitude of options available in our backyard, here are a few exercises that can go outdoors with you. 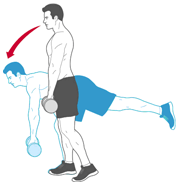 *Superman pushup (full or modified) – This pushup incorporates an opposite arm and leg raise at the top position to train in a transverse plane (posterior oblique fascial line) for increased core strength and stabilization. The modification for this is a kneeling pushup or finding an inclined surface, like a bench or a wall. *Wall jump dips- With your hands on an inclined surface jump as high as you can getting your legs in a tuck position like you are trying to jump up on the wall. *Surfers- Start by lying on the ground and jump into a surfing diagonal squat position, jump back into a plank, lower yourself to the ground, and repeat on the other side. 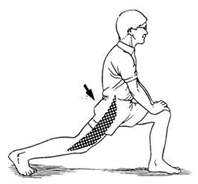 *Multi-directional lunges- Lunges forward, reverse, lateral, or in a curtsy target stabilizers and train proprioception in different planes of motion. *Single-leg squat touch down- Perform a single-leg squat with a hinge motion forward and touch down diagonally with the opposite hand. For an added level of difficulty, add a pepper jump (a single-leg jump) in the top position of the squat for dynamic stabilization. 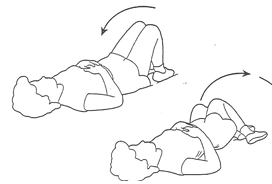 It’s important you know how to do these movements correctly for full benefit and prevention of injury. There are additional outdoor workouts in our archive that can give you more exercises to try. Contact any our fitness staff for details and instruction. Be safe this summer and have fun out there! Sometimes more is better. Sometimes flare is good. Sometimes getting nuts is totally the thing to do. But sometimes none of those things are the answers. When is that the case? When you stop and ask yourself, “Am I getting any stronger, faster, healthier, fitter, am I making progress?” When you answer no to any and all of those questions then it’s time to dial back and get back to basics. Here are a few examples of what I’m talking about, first, moving up in weights. If you haven’t been able to add that extra 10lbs to your squat and press weight the answer may lye more in technique than it does in actual strength. It’s time to break down that complex movement and focus on better full range of motion squats (weighted or just plain old air squats), and then practice your shoulder press form. Breaking down complex lifts so that you can put more energy into each piece so that when you put them back together you are stronger in both aspects of the lift is the best way to be more efficient in your movements as well as increase strength. Same rules can apply to less complex lifts; take the bench press for example. If you feel like you are really struggling to improve your bench press and even more so really struggling to get the bar to your chest at the bottom (lets be real, it’s not a bench press if you aren’t doing the full range of motion) then perhaps adding more weight or doing more reps is not your answer. 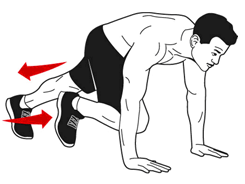 The best way to improve your strength, especially in the full range of motion of the bottom position is to do the old basic push-up. Teaching your body the path of motion and touching your chest to the floor in your push-ups (let’s be real, it’s not a push-up until you touch your chest to the floor) will increase your joint strength and flexibility 200% more than a heavy bench press to 90 degrees. Maybe you don’t care about how much weight you can lift, maybe you care about how well you do during the swimming leg of your next triathlon. You’ve been doing all these super cool exercises with a band, you started adding in some crazy new bag full of sand, or you decided using the strength ropes during every workout for 30 minutes was going to get you faster and stronger. You know what makes you a better swimmer…swimming. Will more strength help you? Sure, but unless you are an efficient swimmer with great technique you can only get so far creating stronger muscle fibers. Sometimes my clients ask me, “How do I get strong enough to do a pull-up? What kind of exercises should I do to improve my pull-up strength?” Easiest answer ever…do some pull-ups. If you are looking to improve your running, run. I don’t think rowing and bicep curls are going to do anything for your 5K time. Sometimes we get sucked into the new craze, the new in thing. There’s been Abs of Steel, Tiabo, standing on exercise balls, standing on Bosu Balls, Kettlebells, Strength ropes, and the list goes on and on. But when all of these fads come and go or at least stop being the “cool new thing” what keeps you ahead of the rest and improving? Knowing the basics. If you can swing a 50lb sandbag around like it’s your job but you can’t do a proper full range of motion squat you are going to have trouble doing much else besides swinging a sandbag around. To be a good athlete, a well rounded athlete, a strong, flexible, powerful, healthy, uninjured athlete you need to start from the ground up. Good training has nothing to do with how hard you sweat, what kind of crazy equipment you use, what kind of protein shake you ingest; good training comes from good movement and good smart progression. As the saying goes, you have to learn to walk before you can run. Learn the basics, if you’ve learned them but let some things slide in order to move up in weight, do more reps, sweat more, etc. maybe it’s time you take a step back and get back to basics. The below workout is one of my favorites because I think it is important to have a variety in the workout. It’s good for your body to changes things up a bit. Move your arms in different directions to avoid repetitive motion. A rotator cuff injury is hard to come back from especially as we age. If we sit at a desk working on a computer all day typically leaning forward and then swimming all freestyle (crawl stroke) keeps you in the same position. Pull those shoulders back be proud of who you are! No time for long runs? Give HIT a try! Once believed to be another workout gimmick, high-intensity interval training, or HIT, is gaining validity in the fitness community. The idea that short bursts of 80-90% maximum effort can produce comparable results to long traditional endurance training almost seems too good to be true. Believe it or not, HIT can help you train for endurance events without hours and hours of training. High-intensity interval training can be performed with most exercises as long as proper form is maintained throughout. Individuals move through a series of exercises at near maximum effort for a short time frame (usually 20-30 seconds) with minimal rest between exercises. This forces the body to activate numerous energy systems that are usually associated with endurance training. New research conducted by McMaster University and the University of Melbourne has confirmed that small bouts of intense exercise not only increases your metabolism but can actually increase the skeletal muscle oxidative capacity and endurance performance. This study validates the idea that HIT can be useful when training for long endurance races such as half or full marathons. Dr. Martin Gabala and Dr. Sean McGee found that HIT also alters the metabolic control during traditional aerobic-based exercise. Since these races usually require hours of long runs, which forces the body to endure more stress, the idea of HIT is appealing to most endurance athletes or those aspiring to become one. Before you go crazy remember that those long runs provide more than endurance of the muscles of the body. Long runs prepare your mind to deal with doing the same physical movement for hours on end. The study, however, suggests possibly limiting the number of long runs by supplementing a few with HIT. After only four sessions of HIT, results showed increases in the mitochondrial enzymes which assist with traditional endurance exercises. After six weeks of training, the gains were significant. This is also useful information for the general population! The number one excuse for not exercises is lack of time! Kick that excuse to the curb, hit the pavement and sprint! Give this HIT workout a try! *Perform each exercise for 30seconds with 30seconds of recovery in between each. For years there has been a belief that resistance training was inappropriate or even dangerous for children. This belief stems from a study performed in the 1970’s by a group of Japanese researchers that observed juvenile workers that were subjected to many hours of lifting and moving heavy objects. On average these children were shorter than their non-working counterparts. Through this observation they concluded that it was the heavy lifting at such a young age that had a negative effect on their epiphyseal plate, and in turn, resulted in a stunted growth. However, recently there has been a growing amount of evidence that suggests that resistance training for children is not only safe, but can be highly beneficial. Researchers from the Institute of Training Science and Sports Informatics published a study that analyzed 60 years worth of studies involving children and weightlifting. The researchers found that virtually all of the children and adolescents benefited from weight training. Interestingly enough, although the older kids did have greater strength gains, compared to the younger kids the difference wasn’t significant. This study also found that, contrary to popular belief, there was no sizable difference in strength increases once the children hit puberty. There was however a difference in hypertrophy (increase in muscle mass) that was likely due to the amount of testosterone in the adolescent population. Because of the lack of noticeable size gains in children, many researchers in the past had concluded that weightlifting wasn’t an effective training method for the youth. So how young is too young to start resistance training? The jury is still out on this question, though most scientific literature seems to point to ages 6-8. Resistance training at this age should involve body weight exercises or very light loads with emphasis on control and form. Squats using a wooden dowel or push-ups are a common method of training children at this age. Heavy loads (without proper progression) or exercises that involve ballistic movements should be avoided when training children. For more information on youth resistance training please contact Will Paton. Welcome runners and field event enthusiast of track and field for Seattle Athletic Club 2013 season. Starting in June at the Shoreline stadium at 6pm Club Northwest (www.clubnorthwest.org) will be having open track and field meet where you can walk, jog, run, hurdle, vault, jump, and throw. The goal is to get everyone regardless of age to bring out there inner Olympian and the atmosphere is awesome with 300 participants. You pay a $6 fee for adults to enter, and you compete against your gender and age only. If you already run and do some weight training, come on out and use your skill to do something different. The meets are every Wednesday until end of August, so if you miss one try the following week. Get out to a local school, or track, get on your running shoes and start training. Here are some fit tips for track prep training to get you motivated. Always jog a lap to warm up and do a light stretch, make sure you are hydrated, and dress for weather. These drills are challenging so take your time to get used to it. You will burn a lot of calories and train the entire body to work efficiently, slowly building stamina and endurance. Today’s practice is tomorrow’s victory. If you need any more info or fit tips please contact Jody Garcia.